To have seen it, you had to be watching either a public or a cable network. You also had to be watching closely. Otherwise, early Tuesday evening in the Democratic National Convention, you missed an ever-so fleeting unscripted moment of democracy at work. The old axiom, “Never watch sausage nor legislation being made”, fits that moment perfectly. What happened was not pretty; in fact, it was downright ugly with a ruling from the presiding officer, Los Angeles Mayor Antonio Villaraigosa (right), saying the “ayes” sounded stronger than the “nays”, a dubious ruling, at best in a vote requiring a majority. If the vote needed more than a majority to pass–this is not made clear–then it is not just dubious, but obviously wrong. The party platform of an incumbent president is dictated by the incumbent. It is intended to outline positions on which the party is in general agreement. The platform committee that shapes the set of positions is appointed from among the delegates. It always contains delegates who can be relied on to deliver language the president wants. The platform is a largely ignored document with a shelf life of about 15 minutes. The only time the platform gets attention is when convention delegates strongly disagree on its wording, setting off a disruptive floor debate. This 2012 Democratic convention had no time for such a debate. The floor debate that Mayor Villaraigosa blocked, has its genesis in what appears to have been platform committee action from Utah Democratic delegates. Other Democratic delegates who were supposed to keep the Platform Committee in line were missing in action when the language was changed. The platform language that was briefly changed was the deletion of “God” and “Jerusalem is the undivided capital of Israel”, both topics using boilerplate language that had been adopted four years ago in the 2008 platform. That insurrection had to be corrected by party officials “at the top” as one delegate said. At the moment, President Obama is locked in delicate negotiations with Israel over the future of the Palestinian people. He has to win re-election if those negotiations are to continue. If Romney wins, there will be no negotiations, just capitulation by a Republican party heavily financed by wealthy Israeli-backers in the U.S. Putting ‘God’ in the platform is an insult to Americans who do not share that faith or whose religions refer to the Ultimate by other names, Allah and Yahweh, for example. That argument, however, does not play well politically in a nation with so many voters firmly believing this nation’s founders were rock-ribbed Christians (which they were not). The Democratic platform retains the magic phrase, “subject to negotiations with the parties involved”, which means that no matter what the platform infers, the future status of Jerusalem remains in the “final status” category. God, of course, is not subject to negotiations. 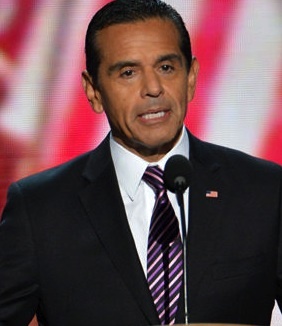 A video clip of Mayor Villaraigosa in the chair gaveling down rebellious delegates, is below. Note carefully shots of two delegates, who wear the Tee-Shirt worn by other Arab-American delegates. The shirt uses an Arabic phrase, “yallah, vote”, or “Hurry up, vote”, to rally other Arab American voters. The woman at right in one shot in the video shakes her head in disappointment and disgust. This race between Obama and Romney remains tight, though the Democrats continue to lead in the key swing states. The language of the platform will have little impact on voters. What impact it does have is that God and “undivided Jerusalem” are handy tools for Republicans to use in their “know-nothing style” campaign ads that whip up their base against the Democrats. Fortunately, for the Democrats, their unscripted moment came long before the major television networks begin airing the night’s proceedings. Only cable networks (which viewers have to pay for) and public television (smaller audiences) began broadcasting at 7 p.m. (EST) while the free (crammed with commercials) major networks waited until 9 p.m. to join the proceedings. During the nightly two-hour commercial network air time, the Democrats ran a smooth convention, highlighting its stars. Not so the Republicans. The Democrats dealt with their unscripted moment of democracy before a smaller audience, and fortunately for them, out of sight of the majority of viewers. What they could not dispose of was the image of AIPAC once again playing the tune to which the Democrats willingly dance. No one knows this better than President Obama. What he needs is four more years in which to show that backbone Vice President Joe Biden spoke of in his glowing nomination speech for the President Thursday night. The President, or those “at the top” who dictated the final 2012 Democratic platform, paid a price of one more small dance to the AIPAC tune, to help the President win his second term. Words in the platform are easier to swallow than an Israeli attack on Iran before the November election. And thanks, it would appear, to the President’s resolve in standing firm against such an attack, Israel’s Prime Minister Benjamin Netanyahu now shows signs of standing down on his determination to attack Iran. If anyone needed further proof that Benjamin Netanyahu has buckled under the pressure and will probably not be giving the order to attack Iran in the next few months, at least not before the U.S. elections, the latest reported IDF appointments seem to supply it. Yedioth Ahronot reported Wednesday that two key appointments in the IDF that have been frozen for the past few weeks are going ahead. Maj. Gen. Yoav Har-Even, who was only promoted last week, will this week become the new head of the IDF General Staff’s operations directorate, replacing Maj. Gen. Yaakov Ayash who is moving to Washington to serve as the IDF military attaché. The other is of Col. A. (name withheld for security reasons), an air force operations chief who will assume command of Ramon airbase, replacing Col. Tal Kalman. Both appointments were in the pipeline for a while and Yedioth surmises that both the decision to postpone, and now the decision to go ahead with the appointments, are due to fact that “the level of alertness and readiness in the IDF, which was at a record high in recent weeks, is about to go down. As President Obama prepares for his final nine-week post-convention campaign run against his Republican opponent, he should be encouraged by these signals that Israel has resigned itself to a second-term Obama presidency. The picture at top of Mayor Villaraigosa is by Kevin Dietsch of UPI for Newscom. Thank you, James Wall! Excellent report. Shared to FB. That was good of you, Jim, to keep us informed. We all need as much information as possible to keep our “facts-checks” current. And you are one who can do it best!! It is a shame that the democrats don’t really respect the democratic will of their delegates. The symbolic moment at the Democratic national convenention in Charlotte tells us volumes. The Democratic Party was my party in my prime. It stood for honest money and the middle class, the timeless themes of the famous “cross of gold” speech of William Jennings Bryan in 1896, the finest political oration in American history. The party fundamentally abandoned those principles (1) by electing delegates on minority status in 1972, and thereby relecting Richard Nixon by a landslide; (2) by adopting abortion on demand in 1984, thereby reelecting Ronald Reagan by a larger landslide, and making Newt Gingrich speaker of the House; (3) by flirting with gay marriage in 2004, and thereby handing reelection to George Bush who otherwise could not possibly have been reelected in the wake of Abu Garib; and now (4) by adopting gay marriage in 2012, after 32 States have banned gay marriage by constitutional amendments, as meanwhile their health care legislation was found unconstitutional on vote of 7-2 by the U. S. Supreme Court — I mean the sanction on Medicaid which was the main target of 26 States bringing suit to strike down Obamacare –, as the tracking polls show no expected bounce from the Democratic national convention, and the jobs report gives less than rapturous news. Again in 2012, (5) they attempted to strike “God” from their national platform, only it was reinserted by the convention chair on an obviously wrong ruling over the protest of most delegates on the floor. God is not merely a philosophical conclusion or a matter of religious faith: it is a constitutional postulate in the United States, as is clear from the Virginia Statute of Religious Freedom which was framed by Thomas Jefferson. To its credit, the PBS Newshour pressed Villaraigosa about having to call a voice vote three times before he could call the ayes victorious. One of the two hosts, I think it was Woodruff, said she thought the nayes clearly prevailed the first time he called for the vote. I find that very encouraging. Yours, Jim Barton, Cambridge, MA. Thanks, Jim! Great clarity in your piece, as always. I am glad about the more TV-visible “Arab-American” (and Indian Sikhs, for that matter) presence at the DNC, in spite of the fact that AIPAC’s bribery for both US mainstream parties has escalated. The performance of all the speakers at the DNC was absolutely formidable and it succeeded in generating the enthusiastic response from the audience. The same cannot be said about most of the RNC speakers. I do hope that the next DNC will be more “inclusive” by incorporating a statement of support for a “Two-state Solution, based on the pre-1967 borders” and “A Unified Jerusalem as Capital for Both Israel AND Palestine”. If not acceptable by AIPAC, then it will be logical and appropriate for opponents of Israeli occupation to deny and remove the AIPAC-Loaded aggressive claim, that it shoved down the throat of the DNC. You can bet that I will vote for Obama. Excellent post Jim, although I’m much more skeptical of President Obama’s ability / willingness to flex more (and certainly not sufficient) muscle to achieve a just resolution of the Palestinian – Israel conflict. Like many progressives out there though, I’ll be voting for him as a vote against the Romney / Ryan ticket and all it represents. Concerning Mr. Graham’s comment above regarding the Democrats’ abandonment of its principles as evidenced by their push for reproductive rights and gay marriage, I would like to offer a response. The adoption of these struggles (the latter clearly being the civil rights question of our current time) as part of the party’s platform seems to be perfectly in line with an evolving party taking on the needs of our country’s more vulnerable. The fact that the issues of abortion and gay marriage were used to defeat Democratic candidates, to me, speaks more of an American majority willing to be manipulated through fear-mongering and vote against their own economic self interests.